restonwood Forest lights up with its 41st annual ‘Nite of Lites’ Event from December 8 through December 30! Please click here for the 2018 Nite of Lites Map. Prestonwood’s 785 homes participate in friendly, holiday-spirited competition for a variety of individual and block recognition categories which are awarded by a committee of guest judges. Additionally, our residents and touring guests contribute to the fun by nominating their favorite homes for the ‘People’s Choice’ award category, throughout December, using this website’s Online Voting feature! December 8 is the Nite of Lites Committee’s Judging Night: A panel of independent judges tours the neighborhood and determines 2018’s “Best of” awards! The individual home award categories are: Best House, Best All-Around, Best Door, Best Mailbox, and Best Lamp Post. The group/block awards are: Best Block and Best Cul-de-sac. The very popular Online Voting for residents and touring guests to nominate their favorite homes for the ‘People’s Choice Award’ will be open throughout December! Watch for the voting link on this website! 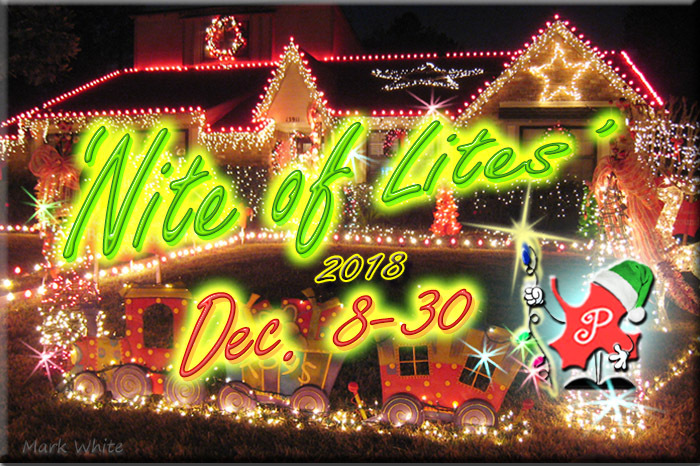 Nite of Lites photos: Residents and guests are encouraged to share their favorite Prestonwood Forest ‘Nite of Lites’ photos and videos by uploading them using the email link on this website’s ‘Event Photo Gallery’. Additional resident-volunteers for ‘Nite of Lites Committee’ activities are always welcome – and appreciated. If you are interested in assisting with numerous activities in support of Prestonwood’s oldest and best-known Event, please click on this ‘Contact Us email link’ to foward event questions or contact information. Please visit this website often, for ‘2018 Nite of Lites’ event updates and online voting!